If it’s just a dry spell, or a real drought, you may need to adjust your stocking rate in your pastures. A plan on paper will help you think ahead, be proactive and make better decisions. Imagine it’s the end of June and it hasn’t rained in awhile. Your region is well below the average annual rainfall and it’s hard to say when the skies might open and give your pasture a little relief. Your livestock are grazing along, not a worry in the world, because it’s your job to figure out what comes next. Prices are still up, and you could reduce your herd. But you’ve spent years, maybe even a lifetime putting a herd together that fits you and the environment you work in. As Lynn Meyers, a Nebraska rancher who faced this scenario, says, destocking part of the herd is “like losing one of the family.” How will you decide what to do? It’s a lot easier to make a decision if you make a plan now. Here are some suggestions for doing that to help you be as successful as you can be in times of drought. Step One: Look at your herd and divide the animals into three groups on paper. Group A is made up of your most profitable cows and yearling heifers that have a lot of potential value. Group B includes your replacement heifers and steers that need a few more pounds so they can hit a good market niche. Group C is all the remaining animals that could be sold tomorrow if forage gets short: early weaned calves, yearling steers, older cows and cows with poorer genetics. It’s important to put this on paper now when you have time to think and reflect. Later, if you’re stressed about what’s happening in pasture, you may not have time, or think as clearly. Your paper plan will help prevent knee-jerk reactions you may regret later. Should the time come that you need to begin removing animals from pasture, you’ve already thought through the very first cattle to take off. Of course, you don’t need to send all the animals in any group to market. The amount of destocking you do depends on your monitoring of the forage you have in your pastures. You might find that you only need to ship out a percentage. Then, once you’ve sent that first group to market, repeat step one again, dividing the remaining animals into Groups A, B, and C. This ensures that you’re sending off those animals you can most afford to remove from your herd. As Greg Judy says, your herd will get prettier and prettier as drought goes on. Reducing your herd is a hard thing to face but drought may not give you an alternative. If you plann ahead, you’ll have a better shot at doing it in a way that ensures your sustainability and profitability. 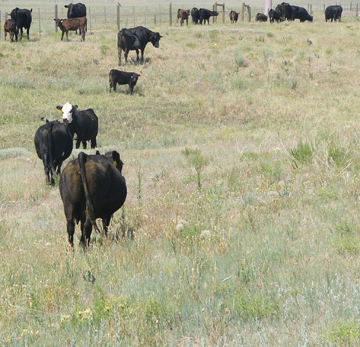 Coming up, we’ll give you some ideas about how to know when it’s time to remove animals from pasture, and share a story from Lynn Meyers, a Nebraska rancher who went through destocking. This article is drawn from a webinar sponsored by Dr. Cody Knutson of the National Drought Mitigation Center at the University of Nebraska, Lincoln. You can watch the webinars online here. Thanks to Dewayne Rice, Area Rangeland Management Specialist for the Natural Resources Conservation Service in Lincoln, Kansas, for breaking down the destocking process for us.